Here are some of the neat features of the nine workshops offered by STEMteachersNYC this summer that you won’t find in the official workshop descriptions. And it’s all in New York City — a pretty cool place to hang out for a few weeks while engaging in great professional development. Even better, bring a friend. Click here to see our flyer and please feel free to share the pdf with your colleagues. Our summer lineup is loaded with great opportunities, and we would love to have you join us! I had a great experience in graduate school at Miami University. Working with Dr. James Poth, I was trained to co-teach draft versions of Physics by Inquiry and Tutorials in Introductory Physics, both developed by the Physics Education Group at the University of Washington. In my lunchtime training sessions, Dr. Poth and I discussed the curricular flow and instructional strategies line-by-line. I learned a lot about the design of physics-education informed curriculum materials, socratic questioning, strategies for redirecting incorrect understandings, and the world of pedagogical content knowledge. But when I got my first teaching job, I found that I didn’t have curriculum materials that fit my students and could be used with the skills I acquired in grad school. 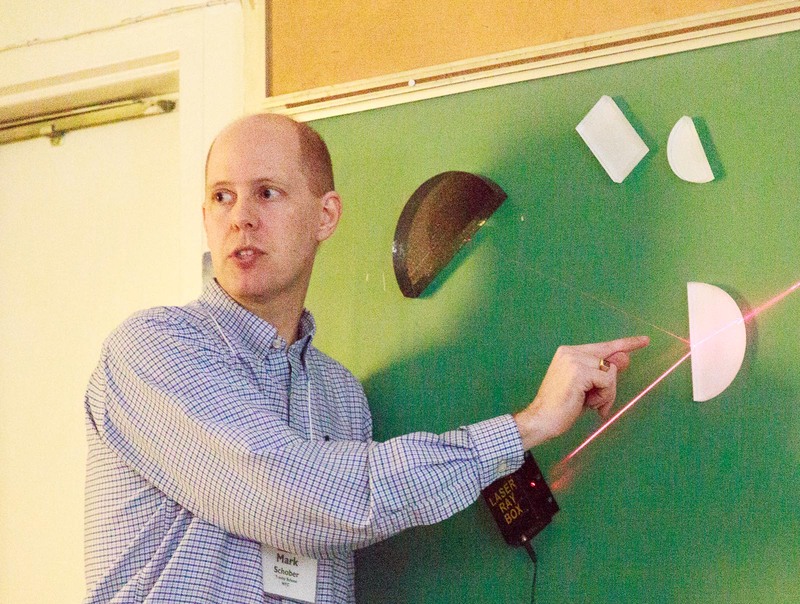 My teaching struggled for a couple of years until I participated in the Modeling Physics Workshop. I very quickly saw how the Modeling teaching framework provided me with the additional tools I needed to implement the other skills I had learned along the way. I was hooked. So this is why the workshop is three weeks long — yes, participants are introduced to a sample curriculum, but, more importantly, it’s designed to help teachers learn many of the things I learned in grad school, providing a framework for understanding why things are as they are in an effective curriculum and how to adapt it to your own students’ needs. The workshops are designed to help you understand an approach to teaching that’s the metaphorical equivalent of teaching you how to fish rather than handing you a fish. Paul and Zhanna are experts in their own classroom practice as well as experienced workshop leaders. They bring a wonderful mix of expertise that allows them to step to the foreground when needed or to pull back and let participants develop their teaching skills through practicing various elements of Modeling Instruction. And, if you’re open to it, I predict that this workshop will transform your teaching like it did mine. When I took chemistry for the first time, the first unit was a completely out-of-context barrage of scientific method, significant figures, and dimensional analysis. The second unit was the quantum model of the atom, and the rest of the year was one random thing after another to the point that the chapter numbering didn’t even matter. I’m thankful for my interesting and engaging professor, but this pretty standard chemistry course was filled with endless rules and exceptions to the rules. Therefore . . . I majored in physics, where I never felt that I had to memorize things, but could figure things out from fundamental principles and scientific thinking. When I took the Chemistry Modeling workshop I was so excited to see chemistry instruction built upon observation, fundamental principles, and scientific inquiry instead of the game of Memory. Starting from what we can observe about matter, we make inferences about matter at size scales smaller than we can see. The inferences constitute testable particle models of matter that suggest followup observations and subsequent revisions to the model. I found I could again use my intuition for pattens, electrical forces, and energy to predict what should and often does happen at the atomic level. I sure felt a lot better about teaching chemistry the following school year, and a few years later, my workshop leader, Tammy Gwara, accepted a teaching position at my school and became an integral member of STEMteachersNYC. Donghong has been leading the chemistry modeling workshop since we began offering it in NYC, and Rachel has recently joined the ranks of modeling workshop leaders by apprentice leading last year’s chemistry workshop and participating in the leadership workshop. Donghong and Rachel will help you to see chemistry in a new way that you’ll love. I taught middle school astronomy and meteorology for a dozen years and found that there are lots of wonderful resources out there (mixed in with some truly awful stuff) but almost all of it lacked larger-scale coherence. Lessons were self-contained and did not build upon one another, representations tended to be largely word-based, and the generally low-level questions were unengaging. I had to work very hard in my own class to develop materials and approaches that engaged the kids’ minds and curiosity to produce deep learning. (Check out my meteorology materials if you’re interested.) The middle school modeling workshop addresses these issues across a variety of content areas through an infusion of modeling principles: use of the modeling cycle, emphasis on multiple representations, facilitation of student discourse, and structuring course content around key models in science. Through the workshop, we want to move you from being an end-user of curriculum to someone who feels empowered to modify materials in a pedagogically sound manner. Erin and Kathryn have been involved from the start of AMTA’s work with middle school science and have seen it grow and develop. They are eager to work with you: helping you think about what do what you do in your classes and how to make your teaching even better. There’s only so much that can be done in a three-week workshop, so once you’ve taken the Chemistry I workshop, you’ll want to continue on to Chemistry II to see the ongoing model development through modern models of the atom, periodicity and bonding, a particle view of heating and temperature, intermolecular forces in biological contexts, chemical equilibrium, and acids and bases. With the particulate and energy representations of matter developed in Chemistry I, students (and teachers) have much more robust tools to reason through and predict what should happen in these sophisticated chemistry topics. If all of the good chemistry isn’t enough reason to come, working with Larry and Donghong for a couple of weeks certainly is. In addition to being our STEMteachersNYC chemistry advocate and chair-elect, Donghong is perhaps the most cheerful person on the planet. Larry has been with Modeling Instruction from the very beginning, and the style and tone of the physics and chemistry materials are due to his writing and editing. Come to learn at the feet of the master. You’ll also pick up on some of his “Dukerichisms,” such as his criticism of the “factino” model of information transmission. Just ask him about it. . . when you don’t have anything in your mouth that might fly out as you start laughing. A three-week investment in a Modeling workshop is a remarkable commitment that thousands of science teachers have made. Of course, it is logistically difficult for many teachers. Therefore, we’re offering a one-week introduction to the principles of Modeling Instruction. Craig and I will introduce you to several aspects of Modeling Instruction such as facilitating student discourse, the modeling cycle, multiple representations in problem solving, and model-based curriculum design. We will explore these ideas by examining the role of energy, electricity, and light in biological and physical science contexts at middle school and high school levels to provide relevant contexts for all participants. You’ll be able to apply these teaching tools right away, and you’ll also have a good sense of what you could gain through one of the three-week workshops. It’s like a movie trailer: enough to get the gist of what’s going on, but leaving you wanting more. A subway train moving at 18 m/s slows uniformly for 8 seconds, and then slows uniformly at a different rate for 12 seconds until coming to rest 210 meters from where braking began. Find the two acceleration rates of the train. I’ll bet that students who start by listing knowns and unknowns before searching for an equation will have a much harder time than those that tackle this by drawing a velocity-time graph and solving it graphically. Then see how well your students tackle angled force problems when they forgo the component vectors and use scale vector addition diagrams. I had no idea how much better these approaches would be for my students until I followed Kelly’s lead and gave it a try. This workshop is a don’t miss! Any time you go to a conference or workshop, it takes at least as much time as you spent in the PD trying to extract the useful ideas and prepare them in a format tuned to you and your students. The opportunity to have a full week to work on anything you want in a low-distraction environment with the opportunity to bounce ideas off of your peers is a great way of getting school-year ready. I call it a camp because it doesn’t have a fixed agenda. Some projects might involve writing or adapting curriculum for your students, testing labs/projects/curriculum, creating videos for “flipped” instruction, developing learning objectives or assessments for standards-based-grading, curating supplemental resources for your class, practicing your programming skills to prepare your students to learn computational modeling, or whatever else is on your “to do” list. I am by no means an expert on all of these things, but I think that I am a good sounding board who can help you to produce your best work. Every day I work with each participant to hear their thought process, see what they have been doing, and then challenge, extend, question, (and sometimes help!) participants in their work. It makes for a great week in which you can leave with something useful for your own classroom to show for your efforts. As the Modeling Instruction movement grows, we have an ever-growing demand for workshop leaders, therefore, the American Modeling Teachers Association made leadership training a priority. Existing workshop leaders contributed their ideas about what should happen during a leadership workshop, and I got the opportunity to work with Art Woodruff to lead the first leadership workshop in 2014. Last year, Craig Buszka and I led two leadership workshops and, in collaboration with our participants, developed an even richer experience with student mode, teacher mode, and leader mode roles. In short, a good leadership workshop offers participants the opportunity to lead and then reflect on their leadership. Participation in the leadership workshop is by AMTA invitation only. Here is what we are looking for in our leadership candidates: Teachers who have taken two three-week Modeling Workshops; teachers who implement Modeling Instruction thoughtfully and successfully in their classroom practice; teachers who are interested in leading Modeling Workshops and are willing to commit to multiple summers of workshop leadership; and teachers who have been recommended by their workshop leaders. If you’re interested in workshop leadership, work towards meeting AMTA’s criteria, ask your workshop leader to refer you, and reach out to AMTA to express your interest. Pick your favorite workshops, and sign up now! And, if you can’t make it to NYC, workshops like these are being offered all across the country. Check the AMTA website for the complete summer 2016 workshop list.